Insurance employees are in a long list of outstanding movies. Sometimes they are the main character and play a huge role in the development of the plot, while other times they are the missing link that pulls a movie together. There are even times when they are the character that either brings a little or a lot of humor to a film. Then, of course there are movies where someone is simply calling to get a life insurance comparison to add a bit of real life drama. Tim Lippe is sent to represent his insurance company at an annual convention in Cedar Rapids, Iowa. Clearly living a sheltered life until now, he checks into his hotel without a clue as to how life operates in a city busier than Brown Valley, Wisconsin where he’s from. He takes a liking to a Norwegian sales agent, sings karaoke, goes skinny dipping and gives a heartfelt speech. A small town insurance salesman sees his opportunity to illegally make a quick buck, but manages to mess it up. His intentions of fraud escalate to theft and then murder, and his plan swirls out of control. It’s not until the last 15 minutes of the film that things start to come together and you figure it all out. This is one employee that should have stuck to answering all those life insurance comparison phone calls. While the FBI trails Strahm, who is suspected as being an accomplice of Jigsaw, Hoffman sets a trap for William Easten, an insurance executive. Easten is kidnapped and taken to an abandoned zoo. When he awakens, there is a vise around his torso that tightens every time he breathes. He has to undergo a series of tests to try to survive. Origins of the move date back to 1973 when HMOs were created after a recorded conversation between Richard Nixon and John Ehrlichman. Sicko is a deeply disturbing, yet darkly funny documentary about pharmaceutical and health insurance industries. Considering 50 million Americans do not have health or life insurance, and some contracts have 37 pages of pre-existing conditions making them unable to secure a contract, it’s a movie that hits close to home. If you have ever tried to get life insurance quotes online, but were turned down, you will relate to this movie. If you have never seen Bill Murray in Groundhog Day, you are certainly missing out. He ends up experiencing February 2nd over-and-over again, and teams up with his former nerdy high school friend who has turned into an unshakable insurance agent. This duo puts the movie as 34 on AFI’s 100 Funniest Movies list. When Helen encourages her husband Bob to go out and save the world one policy at a time, it was hard not to pick up the phone and call for a life insurance comparison. This couple was once world-saving crime fighters, but 15 years later, Bob spends his day in a cubicle, helping old ladies find loopholes in their insurance policy. When mystery writer Andrew Wyke uses his skills to fool an insurance company and the police in order to walk away with a $170,000 settlement, you have to expect that things will go wrong. It is a clever game of cat and mouse wrapped around an insurance scandal in hopes that someone has a good life insurance policy. 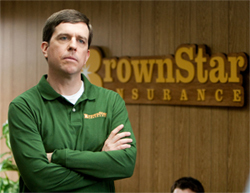 Here is one of the most well-known movies of all time with an insurance employee. Walter Neff, a Los Angeles agent becomes smitten with the wife of a client. After they fool her husband into signing a significant life insurance policy, they make his death look like an accident. Unfortunately, the claim’s insurance adjuster knows something is just not right. The movie is said to be flawless, and one of the most genius screen plays that has ever been written. Guest Author: Compare life insurance rates from leading leading companies at www.lifeinsurancequotes.info.